They call him the Godfather of modern Indian cuisine with his culinary talents having earned him an audience with Queen Elizabeth, a couple of Michelin stars and a restaurant empire that continues to blaze a trail across Europe, Asia and the Middle East. 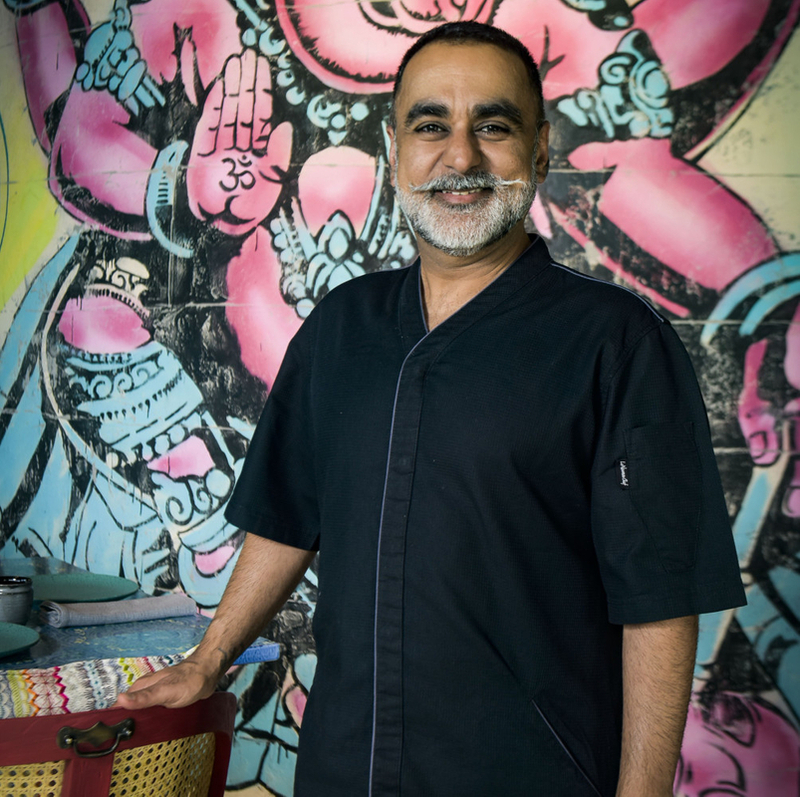 Chef Vineet Bhatia dared to reimagine the Indian food culture in the UAE back in 2005 when he introduced our over-spiced Indian palettes to Indego by Vineet at Grosvenor House Dubai. 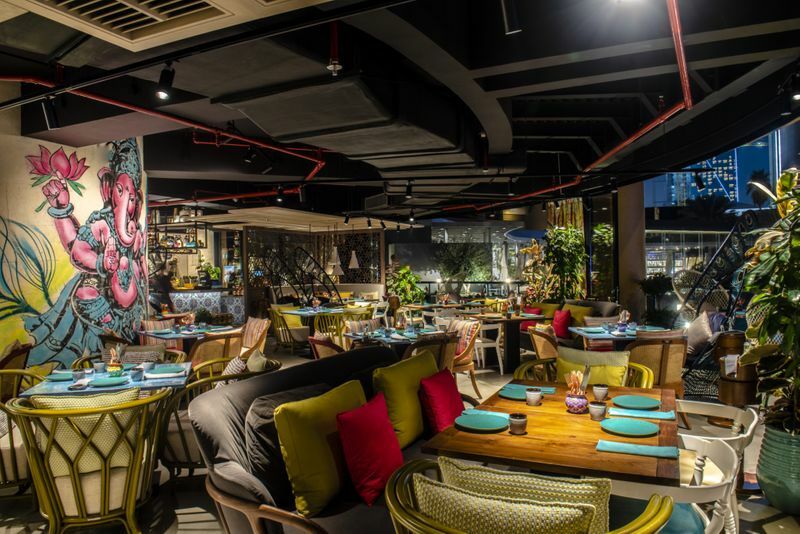 With its modern progressive Indian cuisine, going beyond the much-abused Baltis, Indego shook up the dynamic for future ventures in gastronomy. The 51-year-old’s most recent brainchild — the short-lived Ashiana by Vineet notwithstanding — is one that has the purists most excited. Indya by Vineet, located at Le Royal Meridien Beach Resort & Spa, is positioning itself as the flag-bearer of homestyle cooking. Simply put: this is food minus the theatrics. “At Indya by Vineet, we aim to stand clear of these theatrics and embrace the cuisine in a more traditional sense — we try to let the food speak for itself,” said the chef in an interview with Gulf News tabloid!. Theatrics, according to him, are best limited to the reality TV shows, a genre that most recently saw Bhatia step into the limelight for the Netflix show, The Final Table. A week into the opening of his new Dubai restaurant, we picked his brains to discover the recipe for his success, his take on the UAE food scene and how much reality is there really on those celebrity-driven cooking shows. Q. Tell us about your new restaurant and what does it bring to the UAE? A. Our idea behind Indya by Vineet was to showcase traditional methods of cooking and various cuisines found around India. We attempted to bring regional delicacies and home-styled food into a restaurant scenario. For example, we offer the Charcoal Sev Papdi Dahi Chaat, which is our interpretation of the papdi (crispy flatbread) and has been made with an activated charcoal (which is completely edible). 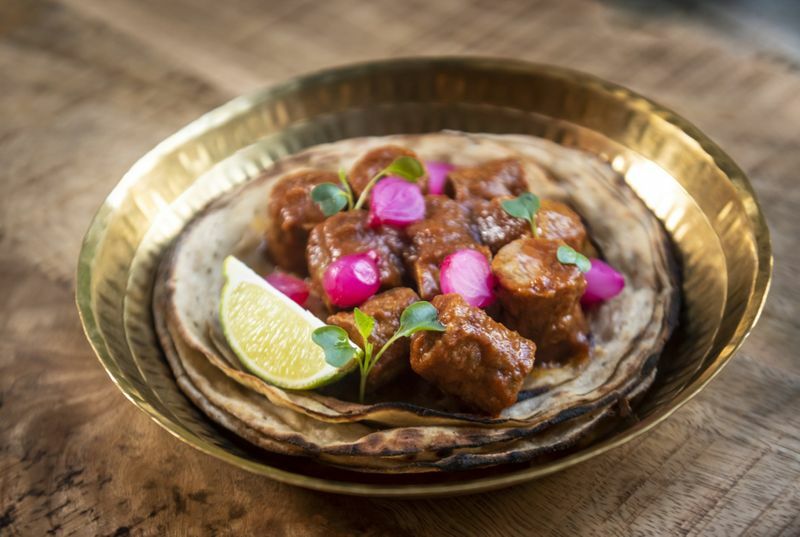 Q. Indian food today provides more bang for the buck in a literal sense with molecular gastronomy and other theatrics creating an almost spectacle of the meal experience. What are your thoughts on this? A. It’s sad to see that Indian food is still reliant on these theatrics and dramatisations in the presentation and taste. Sadly, many places prepare it without understanding the basics and foundations. I find that most restaurants that utilise theatrics in their dishes don’t have an understanding of Indian cooking. Dry ice, gels, and smoke are all used to enhance a dish, but if the foundation and basic elements aren’t right, there is no point. I prefer to focus on the core product and the flavours of a dish in order to drive our sales, not the dramatisations. 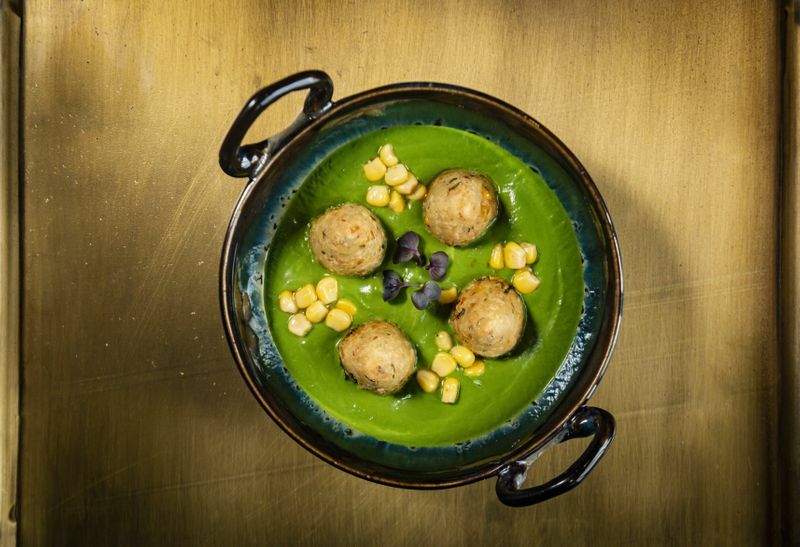 Corn koftas in spinach saag. Q. In an industry that is cut-throat and competitive, what must one do to survive? A. This industry is certainly competitive, but what I believe makes one survive and succeed is definitely the product. What I mean by product is the taste and quality of the ingredients that are used in a dish. Two things that have helped me come this far is always ensuring that my ingredients are as fresh as possible and the end result of any dish represents a part of me. Q. I remember reading in your downtime you often sketch out your recipes. Is this the method to the madness (in a manner of speaking)? A. There is no set way that we tend to function, but sketching is a big part in the evolution of our food. To clarify, before any of our dishes are cooked and plated, it is always sketched out beforehand. We [wife Rashima and I] tend to sketch out independently and sometimes we come up with the same visuals, other times we don’t. When we don’t align with our visual sketches, we each plate up our vision and either collaborate, or choose the one that is more visually appealing. Q. Name the one problem with Indian cuisine you would like to address? A. Generally, what we would like to address and what I have always addressed since the day I stepped foot in the kitchen, is the excessive use of oil, fats and spices. It’s not to say that it’s not there in India, but it’s not necessary, as it masks the product. I have largely focused on removing the excess oils and fats in my food, along with the overuse of spices, masala rubs, etc so I can let the actual flavours of the ingredients shine through. Seekh Kabab Tawa, Ajwain Paratha. Q. What are you most passionate about cooking? A. I’m most passionate about retaining the core nutritional values, while at the same time imparting different textures and flavours to the food. I’m quite a traditionalist, so it still has to look visually appealing but at the same time it has to be cooked in a very traditional way with traditional flavours. I absolutely love using Indian spices on local produce across the globe. For example, in the UK I would use Scottish salmon and give it Indian flavours, by smoking it with charcoal and cardamom — keeping it traditional with a local twist! Q. Are you a traditionalist at heart with your dishes or do you like to experiment? A. I’m definitely a traditionalist that likes to experiment. I was brought up learning all about Indian cuisine, so I use the flavours and techniques as a foundation to experiment. I like to play around with ingredients, but continue to use the traditional techniques, skills and flavours. Let me tell you — there have been some interesting dishes that have immerged through this process! Q. What’s the one dish that needs to be on the menu in any of your restaurants? A. That’s a difficult question to answer because I’d like to think I have a signature approach towards my food and represent Indian cuisine, so it’s difficult to point out one dish. The one dish that does end up being in all my restaurants is butter chicken. I think our take on butter chicken is quite different — it is still done in a traditional way, but it is not very sweet and is quite creamy. We also usually have lamb chops of some variation and chocolate samosas. 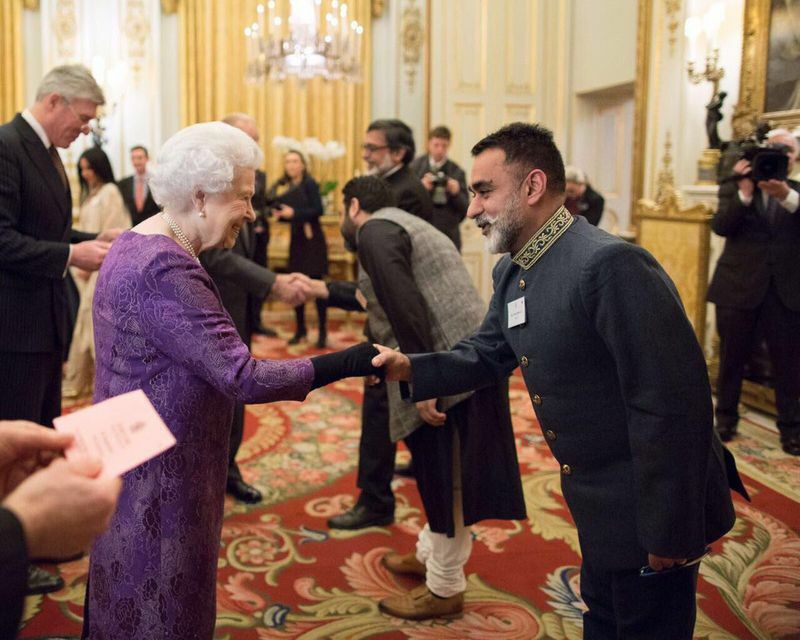 Vineet Bhatia is granted an audience with Queen Elizabeth. Q. What does the Michelin star signify for you? A. The Michelin star is not the be-all [and] end-all, however it is a pinnacle. It makes it easy for another person to understand your calibre as a chef. In my case, it became increasingly difficult to constantly scream at the top of my lungs that I was different. When I received a Michelin star, my explanations about my authenticity and uniqueness automatically ceased. A Michelin star has its own strict, ridged guidelines, which are still in some way understood and appreciated by the audience and the world. It gave me a platform to explain what I was doing and what I had been trying to achieve through my cooking. Q. Tell us about your experience on ‘The Final Table’ and what prompted you to say yes to the show? A. What prompted me to say yes to the show was the selection of the chefs and chef judges that they had put together. At first, I was a bit sad because I thought they wanted me to be one of the participants. Not that there’s anything wrong with that, but at this point in my life, I wasn’t ready to participate and be judged all over again — I feel like I’ve paid my dues. When it came across that I was going to be a judge, I was extremely happy and honoured to share the space with such a strong selection of Chef’s which of course prompted me to say yes. 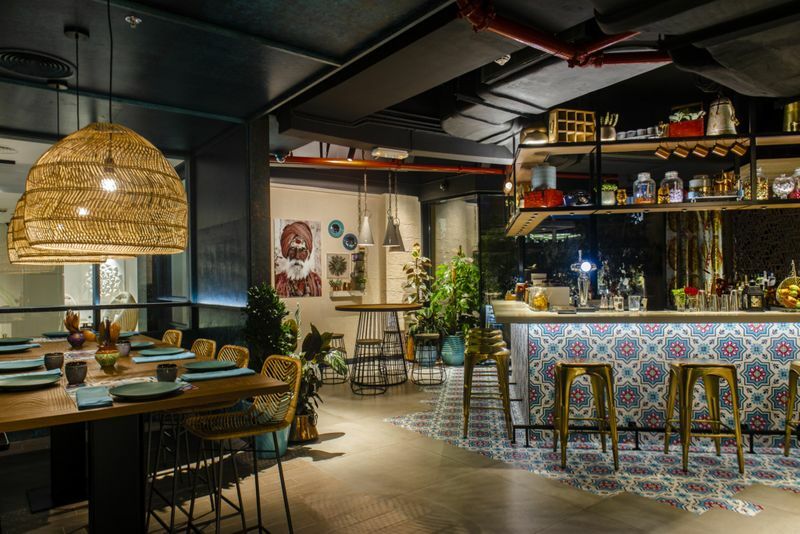 Bhatia’s new restaurant, Indya by Vineet, in Dubai. Q. What are your thoughts on reality cooking shows such as ‘The Final Table’ and ‘MasterChef’? A. My thoughts here mainly stress on the use of the words ‘reality’ and ‘MasterChef’, because to me they are quite contrary. Based on my audition that I had for ‘MasterChef’ in India, there was nothing real about it. It was strange receiving commands and dictations in your earpiece, telling you what to do and why — I strongly disagree with this. My contention here is how real are these types of shows? While the platform is great exposure for individuals, with remarkable culinary talents, it’s just not authentic. Q. If there’s one person you owe your success to who would it be and why? A. I would pick my wife, Rashima. If I were to have a partner who did not strongly believe what I was doing, or foresee my vision and make it our vision, I don’t think I would be where I am today. There have been many instances where I think I have done enough and want to stop, but she’s the one that pushes me and reminds me that we’ve got more to show the world. Q. Which chef do you look up to professionally? A. It’s hard for me to say that there is one particular chef that I look up to professionally, because each one of the chefs I’ve had the pleasure to work with throughout my career has taught me something. If I had to pick one though, I would have to pick Chef Alain Ducasse. While Alain didn’t know it at the time, he indirectly passed on the knowledge that I could be in more than one place at a time — that I could translate my thoughts and my being through my different dishes and restaurants. Q. If you could host a dinner with any three people of your choice, who would it be and why? A. I would host Barack and Michelle Obama (I count them as one), because of what they have accomplished — their trajectory from what they have come up from. I think highly of Barack as a leader, because I believe that he stood for the right reasons. I look up to Michelle for her resilient force. Secondly, I would like to host Amitabh Bachchan — besides being my childhood hero, he has been one person I look up to. He has evolved so beautifully through every key stage of his life. The third person I would like to host is Sachin Tendulkar — the Indian Cricketer. Sachin has come from such humble surroundings and I can understand what he must have gone through. His family believed in him and the process in which he had to go against all societal norms in India of becoming a doctor, accountant, or a lawyer, because all he wanted to do is play cricket. But to succeed to the extent that he has, I respect and look up to him. Where does Chef Vineet Bhatia dine in Dubai? We tend to go to places that are not your high-end fine dining restaurants in the UAE, but more casual places such as Ding Tai Fung for their dim sums, Raju Omlet for eggs and 3 fils. The Michelin-star chef, TV personality and published author spearheads a restaurant empire with brands including Rasoi, Vineet Bhatia London, Maharaja in Saudi Arabia, along with Indego and Indya in the UAE. The former Mumbai resident started earning a name in the late ‘80s by putting his talent to the test for The Oberoi hotel group in India. 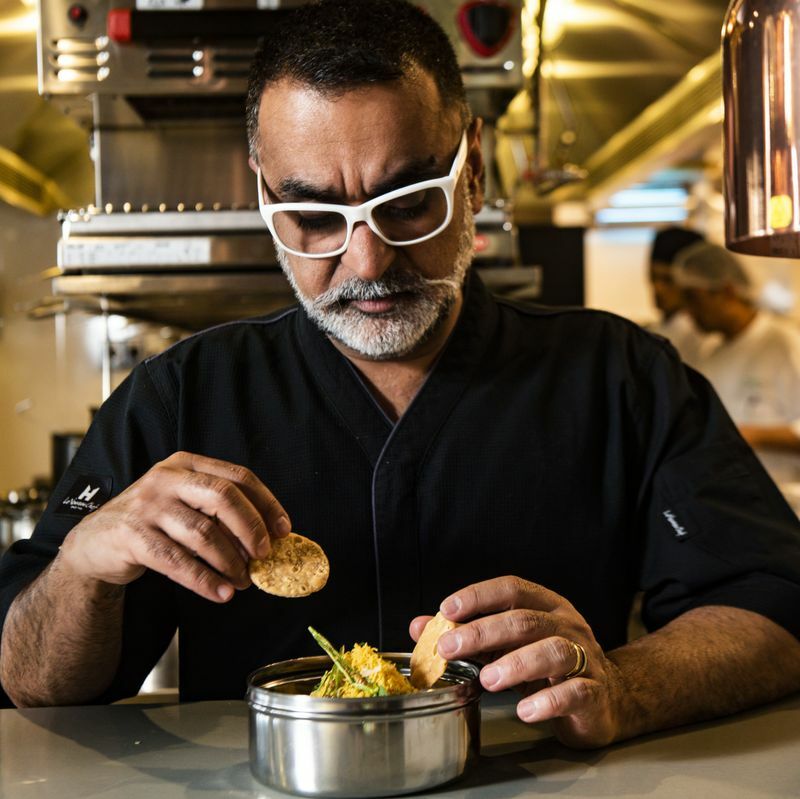 However, the restrains to revolutionise Indian cuisine on his home soil took Bhatia to London in 1993 where he gave free rein to his creative talents and ultimately earned his first Michelin star in 2001 (the same year as Indian chef Atul Kochhar). Three years later, Bhatia would go on to open Rasoi, his signature restaurant set up in a 100-year-old Chelsea town house, which would later morph into Vineet Bhatia London and earn him another Michelin star, yet strangely shut shop a week later for a “fresh new start”, according to the chef. 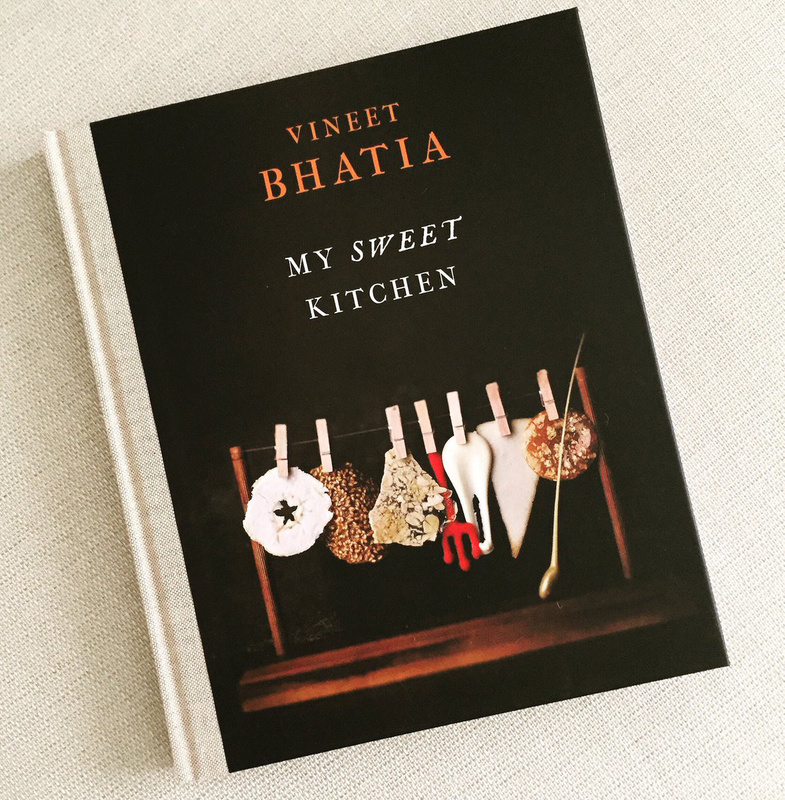 Over the years, Bhatia has racked up a portfolio through his restaurant consultancies, while going on to become a published author with his 2010 cookbook, Rasoi: New Indian Kitchen, followed by My Sweet Kitchen. Bhatia was also one of the handpicked chefs to appear on the Netflix reality show, The Final Table. He is married to Rashima who helps him run his business empire.